Martin O'Neill says his Republic of Ireland side are "still fighting strongly" in their bid to reach Euro 2016, despite their 2-1 loss in Poland. A 2-2 draw would have secured qualification, but defeat means the Republic will have to win a play-off to make next summer's tournament. Poland won with goals from Grzegorz Krychowiak and Robert Lewandowski either side of a Jon Walters penalty. 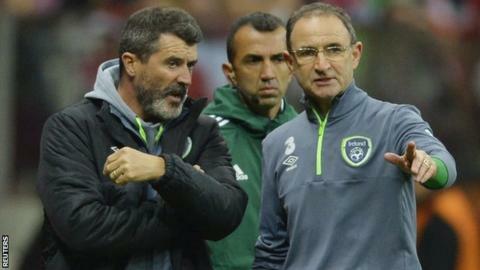 "Whoever we play, we will have as good a chance as them," O'Neill said. "Before we played Germany if you had offered me third I would have taken it. But that win gave us the confidence to come and play here. "We had to go for it in the second half, I actually thought we might have got a second goal, and that would have taken us through. Right until the end we were there but we were perhaps lacking that cohesiveness. "Despite putting a lot of pressure on them it wasn't to be. But we are still in there, we can still make it. We didn't make it but we are still fighting strongly." The Irish reached the last European Championship - Euro 2012 - via the play-offs, Giovanni Trapattoni's side beating Estonia 5-1 over two legs. The play-off draw takes place on 18 October.